What Is The Best ZZ Top Album of All Time? When you think of Eliminator, you automatically go right to the big, monster hits known as Gimme All You Lovin, Sharp Dressed Man, Legs and TV Dinner, which by the way I love to no end. But the album as a whole is just as good and in some cases better. Unless you actually owned Eliminator at one point in your life, I can guarantee that you haven't heard the majority of this instant classic. 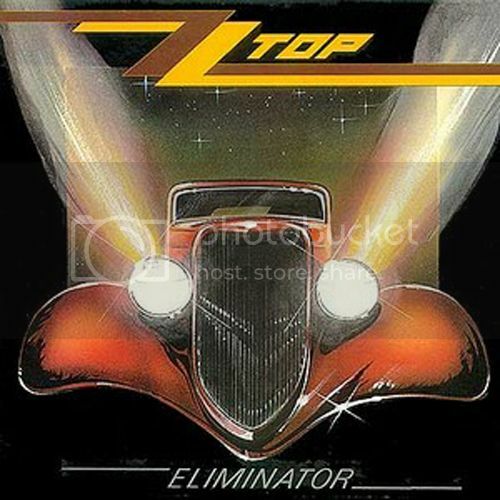 I first got into ZZ Top in a big way because of Eliminator. Sure, I knew who they were prior to this album and knew of a few songs of theirs, but I wouldn't say I was a fan of theirs. I was entrenched in the world of Metal and ZZ Top's brand of music was at the time just too far left in the world of southern, Texas rock. Anyway, when Eliminator exploded onto the scene, it hit with a cataclysmic impact. Thank God for MTV at the time. They had awesome videos to frame their hits, which had some pretty infectious hooks throughout. No need to really break down those songs. Everyone already knows them by now. But I will point out that there are a couple of insanely good songs like I Need You Tonight, I Got The Six and Thug. Thug in particular has some of the coolest slap/pop base lines you will ever hear. Chalk one up for Dusty Hill. It's no small feat to be able to upstage the might Billy Gibbons, but that's just what he does here. Well, that's what I believed at the time. 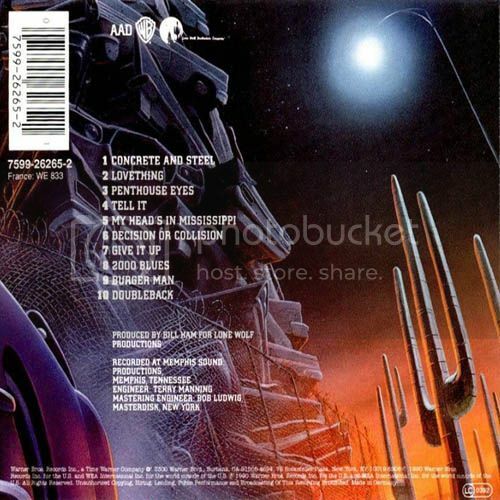 In hindsight, we all know about the actual creation of the album with drum machines and synthesizer and that Dusty Hill and Frank Beard had very little input or playing time on the album. Does it affect my like for the album? Not really. Sure, it's kind of like peeking behind the curtain to see this tiny little man purporting to be the Wizard Of Oz, turning out to be something else all together. I still get a kick out of Eliminator, but it does feel weird that their biggest album to date is really a one man show for Billy. One last thing, I can hear a lot of Joe Satriani on the song I Need You Tonight. Huh? Don't you mean the other way around since this album came out 4 years before anyone heard of Satch? Whenever I listen to this song, I think of Satch more than I do of Billy Gibbons. Listen to the song and tell me you don't do the same thing. Ya forgot La Futura which was released this year. I kind of liked them in the early years. I didn't get the HUGE attraction at the time. I guess it was 3 guys with a big sound. I did like Tush and La Grange a LOT. Then the hits came as you pointed out. But just as quickly as they came, they faded. I haven't heard anything since Recycler. Thanks dude. I knew I forgot something, especially after posting their new video last week. I just couldn't remember what it was. Poll has been adjusted. 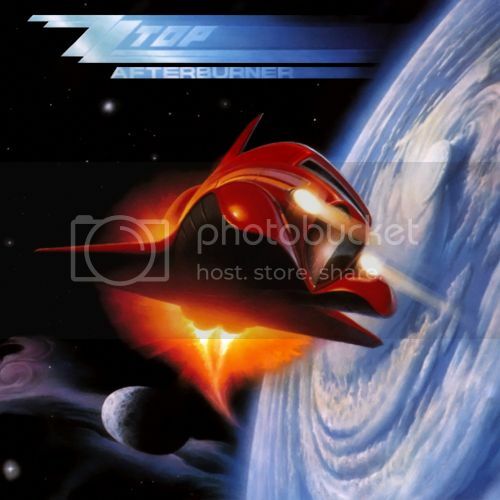 Eliminator may have the bigger and popular hits, but for me Afterburner has my favorite ZZ Top songs during this era. I'm not sure what the overall perception is towards Afterburner, but I kinda get the feeling that because it doesn't have the big hits that it's sometimes overlooked. 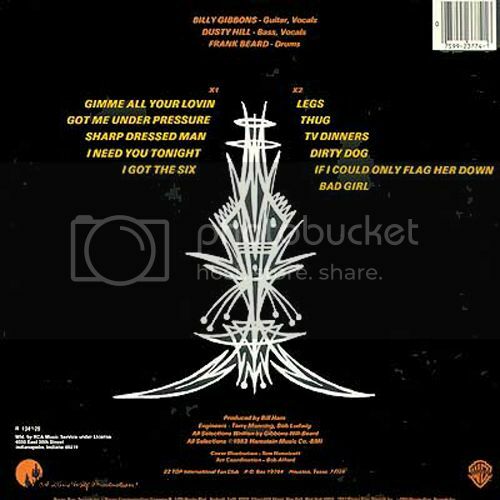 The album is definitely following in the much larger footsteps of Eliminator and does give me my favorite songs by them, but as a whole, the album is slightly less than that of it's predecessor. The album did knock out another #1 hit with Sleeping Bags. But for me, I actually find the song to be less than a few of the other songs on the album. I love the song, but I think there are much better song here. Personally, I just think that the best songs here and far superior are Stages, Rough Boy, Velcro Fly and Dipping Low In The Life Of Luxury. 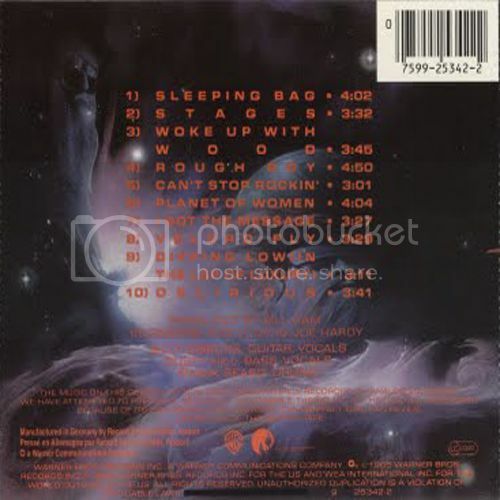 Stages is just a great f u c k i n g song that should have been bigger than it was and I think that a lot of the reason why it didn't catch on had to do with the music video for it. Up till now, the band had come up with some very creative and memorable 'short films' that really propelled their songs higher on the chart. With Stages, we are basically left with a "Live performance" video framed with a TV monitor on an orbiting satellite in space. Yeah, just doesn't scream innovative. Rough Boy is probably the coolest looking video they've ever done and the song itself is tops in my book with some incredible guitar work from Billy Gibbons. Velcro Fly should have been a monster hit. It had everything you'd want in a radio friendly song: Hooks, choruses' and a dance-ready song made for parties. Even the video was awesome. Dipping Low In The Life Of Luxury is another song that is infectious to the very last beat and one that I never get tired playing on a loop. Anyway, this is still a fantastic album and one that you should have in your personal library. Of the 'resurgence' Trilogy of ZZ Top, Recycler is more of the same with keeping in style with both Eliminator and Afterburner. But what those albums offered, on Recycler there really isn't any hits to be found at all. Sure, you can say that Doubleback was a "hit" because it got a major push from the Back To The Future III Soundtrack and appearance in the movie. This isn't a bad album by any stretch. 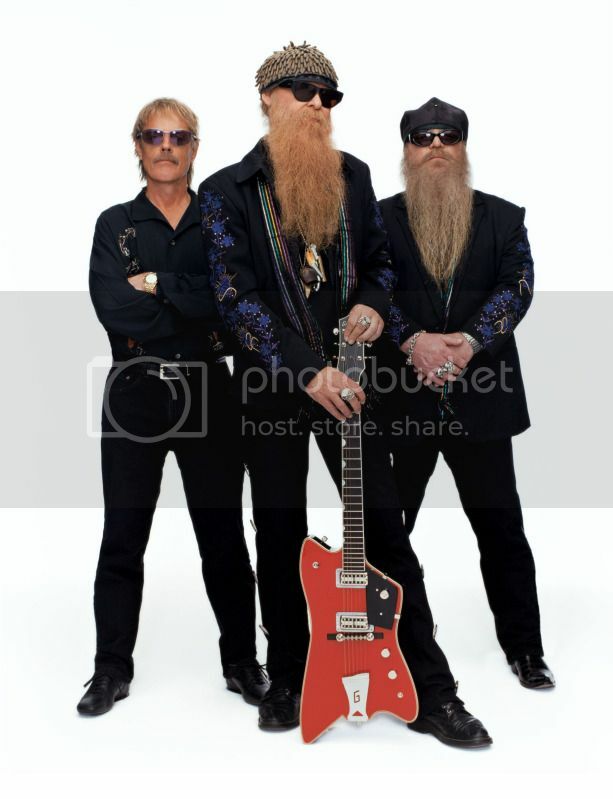 It's ZZ Top, so you know exactly what you are getting. It's just the lack of hit songs that make this feel very lightweight by comparison. I dig the album but it's probably my least listened too one at that, in spite of a couple of cool tracks. 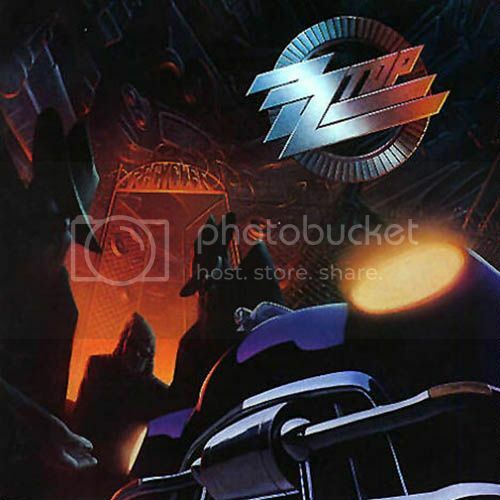 This album more or less was the last one that I would get of ZZ Top and with hardly any video airplay on MTV at the time....they receded from my eyes. I would listen to them over the years and check out new songs off and on. But I never was moved to the point of wanting to get another ZZ Top album like I did with this Trilogy of albums. Didn't the rock stations play My Heads In Mississippi? Well, it seemed our station did and left the others like Doubleback to MTV. My Heads In Mississippi did get its spins on local radio here. But it just seemed like the only thing most were playing off Recyler (Radio and MTV) was Doubleback.